On my own again in the world of media: books, movies, and TV. After finishing both the Wolf Hall miniseries on PBS, and the two books from which it was adapted (Booker Prize winners both, Wolf Hall and Bring Up the Bodies, by Hilary Mantel), which I read pretty much in tandem with, or just ahead of, the miniseries, I decided to really overwhelm myself with some Tudor mythology. I rewatched the fantastic 1933 film The Private Life of Henry VIII (directed by Alexander Korda). Other interested parties should know that, in addition to being on DVD, the film streams at Hulu (with a Hulu Plus subscription) and for absolute free at archive.org. The film is overall a bit sunnier in appearance than more modern palace intrigue films; the vogue now is to film inside cramped spaces lit by a single candle so everyone and everything is in shadow and we can understand how brutal it all was. The action is mostly concentrated inside, so we don’t get any jousts, though there are choreographed dances and a wrestling match. The relationships are the feature and the draw. But further, there is something odd and beautiful in the narrative structure that even after this, my third or perhaps fourth watch, I can’t quite put my finger on. The story unspools strangely. The first scene (after the titles which give the viewer a brief orientation in Henry’s marital history) is an unlikely one: a gaggle of women, seamstresses or embroiderers, giggling over Henry’s bed and speculating what it must be like to sleep with a king. A double-edged sword it is, really, as indicated by this particular, a day when Anne Boleyn will be executed for treason, and when, once the death is verified, Jane Seymour will marry into her place. Being married to a powerful man means also being vulnerable to the man’s power. In the first few minutes, we also get to meet the townies who are settling into the bleachers, primed and ready to watch Boleyn’s death, and an English and a French executioner posturing over who is more qualified to behead a queen. Then courtier Thomas Culpepper goes to fetch Jane at the king’s behest, and the two of them run, childishly, from one end of the palace to the other, to return to him. The odd playfulness of the moment renders it almost dreamlike. Certainly, it does not adhere to any sort of standard biographical film template (which may not have even existed at the time). Henry finally appears something like 10 minutes into the movie, his voice knifing through the chatter of his servants, his stance in the doorway imperious. He barks at his advisors, but also lasciviously nibbles at the neck of Jane (played by Wendy Barrie) when she comes in. He’s a huge man and boorish, but also graceful and emotional. Though the Oscars were barely in their adolescence when The Private Life of Henry VIII came out, it did manage to claim a nomination for Best Picture and a win, Best Actor for Charles Laughton, who—Damian Lewis be damned!—is my quintessential Henry VIII, red hair or no. We get another parallel here—a chilling one, where the film cuts from the man hammering away at the chopping block where Anne will lose her head to Henry, pressed up against the grating of his palace window, rhythmically tapping, impatient for the act to be done, the barbaric act he has put into motion. Poor Jane Seymour is dispatched with quickly, as she was in real life, and the largest portion of the movie deals with Henry’s fifth wife, Katherine Howard (Binnie Barnes). Fifth chronologically, she is second of the ambitious schemers, Boleyn being the first. She manipulates her way into Henry’s favor, secures herself the queenhood, but continues to carry on with Culpepper, to the detriment of everyone. My favorite of the wives is the fourth, Anne of Cleves, the oddest of odd ducks, an awkward but intelligent German noblewoman who agrees to be married to the great king, but then talks him out of consummating it, ensuring herself a favorable annulment settlement and status as the “King’s Beloved Sister” that she would retain for her natural life. The scene where Henry and Anne spend their wedding night playing cards is a classic—she beats him soundly, and Henry stalks out of the chamber, where multiple noblemen and statesmen are waiting to hear of the de-virgining, and are instead met with the interrogation, “Anybody got some money? Somebody get some money!” Anne turns out, improbably, to be a confidant for Henry. It can’t be an accident that this great role went to Elsa Lanchester, Laughton’s wife (and future Bride of Frankenstein). The women are a great draw in this movie, but the true star here is the gruff, plump Laughton, virile in his character’s youth but increasingly grizzled as the years and wives wear on. (Those ever-changing embroidered initials over Henry’s bed mark time passed and new vows said.) Henry does awful things, and allows awful things to be done in his name; he is far from a pure soul. (The movie seems to want to position Culpepper, played by Robert Donat, in this role. It doesn’t really succeed at that, especially because his part in the Katherine Howard affair is never resolved in the movie.) But when Henry gloats and beams over his newborn son, he seems like a good man, just one stuck in a difficult situation. The character’s increasing age also brings increasing sympathy, and late in the film he describes feeling more peaceful, less inclined to fight and wage war over territory. Not really a factually correct facet of Henry’s history, but narratively, so very satisfying. You know, I love scary movies, and I really thought I had seen The Spiral Staircase, but nothing about your review rang a bell, so I will have to track it down. Thanks for commenting! A marvelous review of a classic early film about courtroom intrigue. Laughton’s bigger-than-life performance always dominates the film for me, but the wives are well-played, too. I love the scene you describe between Laughton’s Henry and Elsa Lanchester as Anne of Cleves (who turned out to be the smartest of the royal spouses). You’ve reminded me that I need to see this film again, not only for the performances but also for its masterful storytelling (e.g., the ever-changing embroidered initials you mention). Thanks for participating in the blogathon! Thanks for hosting it! It was great fun. I’ve got to see this!! 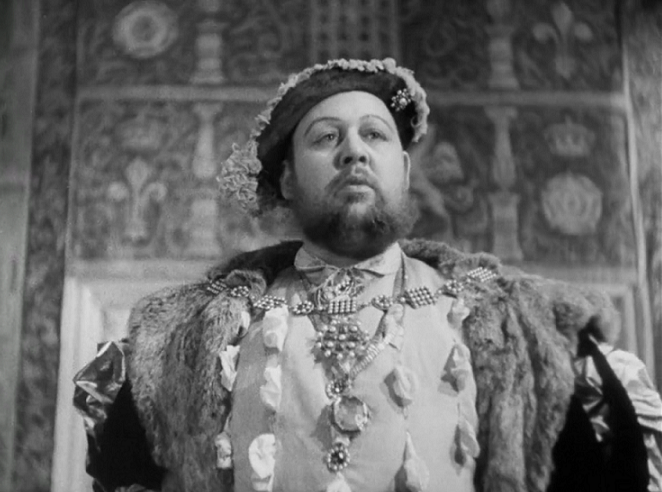 Charles Laughton as Henry VII? Couldn’t make a better casting choice, in my opinion. Thanks for the introduction to this film. Book Reviews: Winter Nonfiction Remember When 30 Rock Nailed Its Final Season?